Learning resource. This will not require anything from you as developer. itslearning will track if a user has read resource or not. Learning activity without assessment. Sometimes you may not need assessment for learning activities, only the possibility to have the extra permissions participate and evaluate. itslearning will track if a user has accessed an activity or not. The discussion tool in itslearning is an example of a learning activity that does not use assessment. Learning activity with simple assessment. This will allow you as an application developer to set a percentile score, comment, simple status (not started, in progress, completed) and time spent. This is very much like the way scorm and aicc content works. Learning activity with advanced assessment. This will make use of the dynamically created assessments and assessment statuses users can find in itslearning. These will differ from site to site and are of course available to get and use via the rest api. This is how the test and assignment tools in itslearning work. There are two types of assesments: simple and advanced. 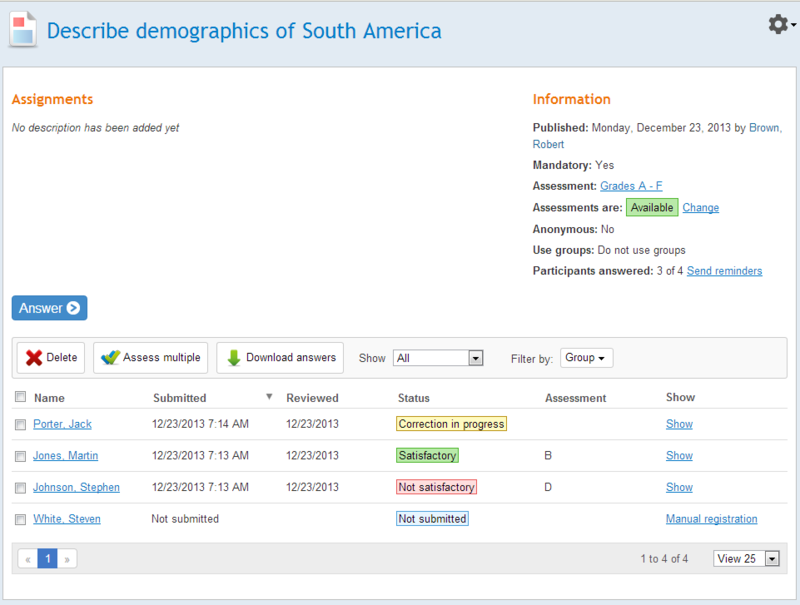 itslearning will store the data sent from the application and make it possible to view assessments in reports in e.g. the course. - AssessmentId (e.g. Id for "grades A-F"). "Score" assessment scale is unique type of assessment. Display available assessments and/or assessment statuses for a learning object instance, so that the teacher can select them in the user interface. Make call to itslearning to store the selection. When the teacher (or user with evaluate permission) evaluates e.g. an answer, you should display valid items connected to learning object instance (assessment items and/or assessment status items) and store the selection in itslearning. LearningObjectInstance.MaxScore should be defined. MaxScore used as scale of assessment. Example: If MaxScore was set to 200.0 Score for particular person can be 50.0, 125.5, 200.0 or 300.0. If look in grade book and use percentage view, assessments will be 25%, 62.75%, 100%, 150%. LearningObjectInstance.UseScore is helper, which helps you identify when LearningObjectInstance using "Score" assessment scale. Also we have AssessmentConstants.MaxValueMaxScore = 99999.99.